A road safety show and family fun day was held at Ballymote Shopping Centre, Downpatrick on Sunday 25 August. 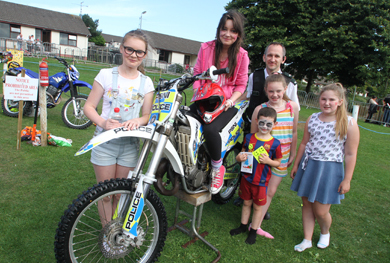 Downpatrick Neighbourhood Policing Team have been working in partnership with a number of local and regional agencies to promote a Community Safety Program targeting anti-social behaviour of off-road motor vehicles. The Down PCSP, the Flying Horse Ward Community Forum, Downpatrick Fire Service, Down Rural Community Network, Surestart, and the Youth Service, were all involved including the Motor Cycle Racing Association. As part of this, the PSNI have designed a high spec Moto Cross bike in PSNI colours. 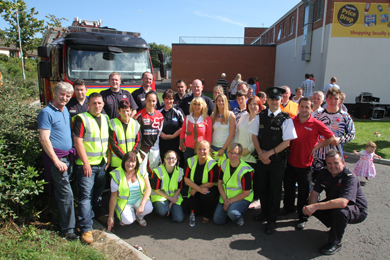 The different agencies involved in the partnership with the PSNI attended the road safety and fun day at Ballymote. This was a show piece similar to Project Evo or the popular PSNI tractor. It is race-ready and meets the highest levels of ‘scrutiny’, the term used within motocross to describe race readiness.It has also been fitted with state-of-the-art crime prevention technologies supplied by Data Tag and fitted by PSNI roads education branch.The bike serves two purposes. The first is that it is a show piece – something which can be used as an educational tool to demonstrate safety issues the local youths need to watch out for.And secondly, it is a fresh approach and a first for Northern Ireland as a solution to the perpetual problem of youths causing nuisance and danger to themselves and residents by riding motorcycles through housing estates as they are currently doing.Constable Phil Quinn said:“The PSNI are working with the support and guidance of the Motorcycle Racing Association (MRA) to develop a Community Safety Program based around racing and husbandry of motocross (MX). The program will supply and maintain a small bank of MX bikes, clothing and protective equipment. “This will be used this to establish a group that will learn all aspects of the sport of motocross. Everything from marshalling, first aid, mechanics and of course learning to ride will be included in the program. We hope to work with a broad range of contributors such as SERC and the local neighbourhood regeneration committees.”“There is a broad range of benefits coming from a program like this. Improved skills and abilities may be the more obvious ones but there are the less obvious such as improved confidence, discipline and physical training. Downpatrick Neighbourhood constable Phil Quinn pictured during the road safety and fun day with some young children from the Ballymote area interested in scramblers. On the day, other partner organisations who supported the event well-attended event were all delighted with the outcomes. Lawrence Spence, Chairman of the Motor Cycle Racing Association said: “It is vital to improve road safety whenever we can and this will benefit the community enormously. It aims to encourage the use of more quieter bikes in estates, and for users to be more aware of the landscape they are in. We can’t emphasise enough the need to learn good safety practices early on – on and off the road. That includes proper bike maintenance, proper bike handling and wearing the proper clothing. Senior bikers perform a demonstration at Ballymote. Speaking at the event, Down Policing and Community Safety Partnership member John Gordon said: “We have been trying to target areas of anti-social behaviour by rolling out action plans and we are only to happy to support this initiative addressing a key community safety issue. The multi=partnership agency approach is vital to secure good outcomes and deal with the difficulties of motor bike and quad issues in our estates. “We fully support the innovative plan to have a motor bike school opened up working with our local young people creating a safer environment for all. Narene Skeffington, Ballymote based Youth Service worker, added: “Currently our local youth members are involved in a community safety project and when it is complete the young men will attend a special session at the Eddie Irvine Racing Centre and the young ladies who are enjoying a beauty course will go on to study this at a higher level. “We operate four evening a week from the new Ballymote Health and Wellbeing Centre and start off again in September. County Down Rural Community Network development officer Ann Grant said: “We’re delighted to support this project. The fun day has been a great success with lots of children taking part. 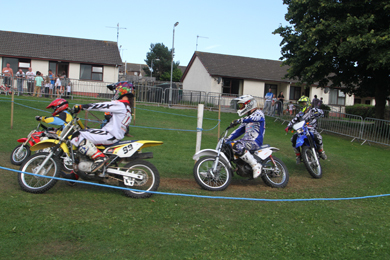 The display of the motocross bikes has attracted a lot of attention. Downpatrick Surestart also helped out on the day and Niamh Wallace, health development worker, said: “Today has been a success because of the partnership approach and Surestart are keen to see safety improved as with uncontrolled use of motor bikes, an accident is more likely to happen.